As the trend in amusement parks has gone from family-owned theme parks to large franchises, it is not surprising that there are many closed amusement parks throughout the country. Each one is a blip on the map; a part of nostalgic Americana that tells the tale of a bygone era. It used to be that most amusement parks were family-owned and operated or started by a single investor with a vision. Each amusement park offered unique attractions rather than bigger or faster rides. It was not until the 70s, that corporate-backed theme parks began to really take off, and little by little, smaller establishments started to close down. 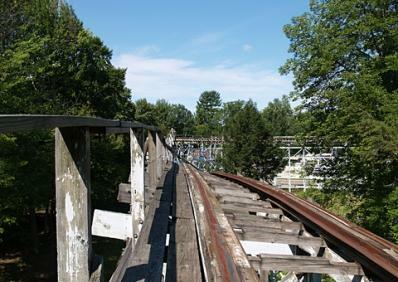 Taking a tour through America's closed amusement parks is like taking a tour through a modern era of American history. Legend City was a western themed park that opened in 1963 but had a short-lived legacy. It was demolished in 1983. How Legend City became a staple in local folklore is somewhat of a mystery as the park was plagued with bankruptcies, changes in ownership and a series of closings from its conception. Nonetheless, locals seem to have nothing but fond memories for the place. Particularly notable, was the Golden Palace Saloon where local kids' show stars would regularly appear to entertain crowds of kids. Dogpatch USA was a theme park based on the comic strip Li'l Abner. Like many other abandoned parks, it suffered from a series of financial difficulties and closed its doors in 1993; however, in the beginning, the park did very well. Its demise began when investors sought to expand it with the misguided idea of an adjacent ski resort. Chutes Park is one of the earliest amusement parks in the United States and a great example of the evolution of the amusement park industry. Chutes Park started as a trolley park in 1887. Since it was a hub for transportation, the owner began to bring in variety acts. Next came an orange grove but by the late 1890's the park was overgrown and out of use. As ownership changed hands at the turn of the century, the new owners brought in rides including a roller coaster, a new baseball park, and a carousel. The park changed names but the real end came when the then named L.A. Angels moved to Wrigley field in Los Angeles and the area was abandoned. As the name might imply, Japanese Deer Park was a Japanese-inspired amusement park that boasted freely roaming deer throughout the grounds. The park was modeled after a famous Japanese garden. Aside from the deer, the park's main attractions focused on the natural world and included things like a koi pond and dolphin center. Sadly, as the park faced mounting debt, the owners killed off several hundred of the deer by lethal injection. A precursor to the more popular theme parks like Disneyland, Knott's Berry Farm, and Universal Studios, Jungleland USA started out as a training ground for Hollywood animals. Animal shows at Jungleland USA were extremely popular in the 50s and 60s but Jungleland eventually met its demise as it was crowded out by other, more popular California theme parks. Manhattan Beach was the first amusement park built west of the Mississippi River. It opened in the late 1800s but was plagued by a series of unfortunate events. For example, Roger the elephant, one of the park's key attractions, got spooked by a hot air balloon and bucked his passengers, stomping on the head of a little boy. It was also destroyed by fire in 1908. Bad press coupled with competition from other nearby amusement parks led to Manhattan Beach closing in 1914. The National Amusement Park Historical Association (NAPHA) is a wealth of information if you are interested in finding out more about America's amusement park history. A family membership is only $40 per year and it comes with access to a wealth of information on an era that is remembered fondly.